SOMETHING TO PONDER during Black History Month: In the long dark night that followed Reconstruction, what was the engine that drove Jim Crow? Did segregationist laws codify the existing social practice, or was it the laws themselves that segregated the South? "If we must have Jim Crow cars on the railroads, there should be Jim Crow . . . passenger boats," he wrote. "Moreover, there should be Jim Crow waiting saloons at all stations, and Jim Crow eating houses. . . . There should be Jim Crow sections of the jury box, and a separate Jim Crow dock and witness stand in every court -- and a JimCrow Bible for colored witnesses to kiss." Tragically, what the Charleston editor intended as mockery would soon become reality across the South -- "down to and including the Jim Crow Bible," as Woodward noted. But it wasn't an overwhelming grassroots demand for segregation that institutionalized Jim Crow. It was government, often riding roughshod over the objection of private-sector entrepreneurs. 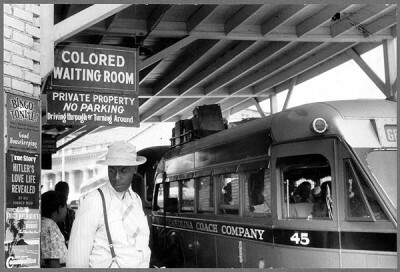 Far from craving the authority to relegate blacks to the back of buses and streetcars, for example, the owners of municipal transportation systems actively resisted segregation. They did so not out of some lofty commitment to racial equality or integration, but for economic reasons: Segregation hurt their bottom line. For one thing, it drove up their expenses by requiring them -- as the manager of Houston's streetcar company complained to city councilors in 1904 -- "to haul around a good deal of empty space that is assigned to the colored people and not available to both races." In many cities, segregation also provoked black passengers to boycott the streetcars, cutting sharply into the companies' revenue. In a notable study published in the Journal of Economic History in 1986, economist Jennifer Roback showed that in one Southern city after another, private transit companies tried to scuttle segregation laws or simply chose to ignore them. In Jacksonville, Fla., a 1901 ordinance requiring black passengers to be segregated went unenforced until 1905, when the state legislature mandated segregation statewide. The new statute "was passed by the Legislature much against the will of the streetcar companies," reported the Florida Times-Union. So well-known was the companies' hostility to the law that when a group of black citizens mounted a court challenge to overturn it, their attorney felt compelled to deny being "in cahoots with the railroad lines in Jacksonville." In Alabama, the Mobile Light and Railroad Company reacted to a Jim Crow ordinance by flatly refusing to enforce it. "Whites would not obey the law and were continually . . . refusing to sit where they were told," the company's manager told a reporter in 1902. In Memphis, the transit company defiantly pleaded guilty to violating a Tennessee segregation statute, explaining that it believed the law to be "against the wishes of the majority of its patrons." In Savannah, the local black paper noted that streetcar officials "are not anxious to carry into effect the unjust laws . . . requiring separate cars for the races," since it would put them "to extra trouble and expense." Eventually, of course, the government got its way, as companies surrendered to pressure from city hall and the statehouse. In a victory of government regulation over the free market, Jim Crow took hold across the South, where it would cruelly hold sway for the next 60 years. Many Americans know that it took strong government action in the 1950s and 1960s to end segregation and bring civil rights to the South. Fewer realize that it was government action that established segregation in the first place. Today, when the power of the state is being aggrandized as never before, the history of Jim Crow offers a cautionary reminder: When the political class overrides the private sector, what ensues is not necessarily an improvement. It may even be a national disgrace.